In any given place or time the church will demonstrate by its actions its philosophy of cultural interaction. In other words, the church makes choices which communicates volumes of how it perceives itself against the backdrop the prevailing ideas, morals, and methods of its culture. The Gospel was given in order to transform individuals to the likeness of Jesus Christ. The church was established to be the instrument through which that transforming message and power is to be communicated and demonstrated. Therefore, how the church interacts with its culture is an important issue in regards to faithful proclamation of the treasure of the Gospel with which it has been entrusted. How the church behaves as individuals outside the walls and away from scheduled meetings and how the church behaves corporately when it acts together is incredibly important. In both arenas a clear message is being sent to everyone about the nature of the relationship of Christian faith to its culture. And this in itself is critical to the faithful proclamation of a whole Gospel. How accommodating a church is to its culture is an important question. I think there are three basic approaches leaders and churches take in regards to interaction with the broader culture. And within these primary approaches there are certainly secondary shades of difference, but I think evangelical churches tend to fall into one of these on a fundamental level. The church that stands against its culture marches to a defiant beat. This is an approach fueled by fear, seeing all that's wrong in the culture and spending the most energy condemning it while retreating from it. There is much emphasis on keeping oneself unstained by the world and protecting the church from corruptive influences. This approach leans heavily to a self-protective mode, which in turn projects a distinct "us" versus "them" vibe to those on the outside looking in. The result of the church against culture mentality is an unhealthy fear of those not like us and a tragically hidden gospel. The gospel might be preached from the pulpit or taught in a Sunday school class, but it's not lived out on the outside because people are too concerned with staying away from the wrong kind of people. This church will always be negatively known for what it stands against and not positively what it stands for. The church that accommodates its culture dances to imitative rhythms of the world. It's governing dynamic is to appeal to people, to be likable, relevant and cool. Much of its energy goes into staying edgy and fresh. The next big thing is always the next biggest things since the last biggest thing ever. Primary emphasis seems to be placed on style. Typically, the style of worship is a dark room with a band playing loud praise songs with all the trappings of a rock concert. The messages are typically borrowed, topically-driven and reworked series from the latest guru of edginess. This style alone is not the problem, but churches that tend to present worship this way, are the ones that tend to drift toward worldly means and methods. The church that allows accommodation to steer the ship may find itself also rethinking issues related to morality and ethics. If the consensus within the culture has shifted on a particular moral issue, the accommodating church may find itself tempted to move with the culture rather than risk offending, all the while employing high sounding rhetoric of inclusion, love, and not judging to explain the biblical flip flop. The result of the accommodating church has always been an uncritical evaluation of prevailing cultural opinions and/or of methods, both in regards to appropriateness and integrity. Sometimes the biblical content is compromised or thrown out if the cultural consensus has grown to reject it. However, even if the theology from the pulpit is sound, the methods for gaining a crowd may be at times questionable. The language, look, feel, and attitude all evidences of getting just a little too chummy with the world. This accommodation is prone to invite a spiritual confusion that doesn't help a believer develop better discernment about what is and is not congruent and with a Christian lifestyle, but creates even more gray area. At worst the adapting church results in a superficial gospel garnished with a lowering of the bar for Christian living. The church that works to transform its culture with the gospel hopefully steers a faithful course through the two pitfalls of the extremes described above. It faithfully runs the race with a focus on the finish line of the glory of God. If you placed the church against culture on the far right end of the scale and the church accommodating its culture on the far left end, then that implies there are numerous points along the scale. Now, imagine the church that wants to transform culture right in the middle of that line. This church neither wants to be known for what it's against (even though it will stand against some things), nor for accommodating the culture to the point where it caters to the wrong things simply to attract a crowd (even though it will have to employ methods and have a style). The church that believes that the gospel is sufficient to transform individuals knows that it is also called to work, but it will be discriminating about its methods and practices. Also, this church will demonstrate great grace to outsiders to whom it desires to get the gospel. Believers will be challenged to live the whole gospel while thoughtfully engaging the culture with the precepts and principles of the Bible. This church will spend as much time praying as planning and will seek what is faithful and spiritual more than what is merely pragmatic and effective. This church will desire to see more people reached with the gospel, but will not be willing to simply get a large crowd and manipulate responses with questionable means. The end results for the church that wishes to transform its culture with the gospel will be a people who are discerning and loving. Simultaneously the church will preach and teach truth and love people in ministry and know how to draw appropriate lines so the world opposed to God doesn't transform it. This church will reach out with the message of grace to all and refuse to be assimilated to unbiblical messages, morals, or methods. For me and other pastors, the question is this: What kind of church are we leading and teaching our congregation to be? The long-term consequences of the answer are profound. Currently KY HB 184 (a.k.a. the ultrasound bill) is making its way through the Kentucky legislature. The bill would amend previous legislation concerning the practice of abortion and the issue of appropriate information given to a woman seeking an abortion. The added features of this bill is to add the requirement of a face-to-face consultation with physician who will perform the abortion at least 24 hours before the procedure. Additionally, the bill would require the physician to give the woman an opportunity to view "an active ultrasound image of her fetus, hear the heartbeat of the fetus if the heartbeat is audible, and receive a physical picture of the ultrasound image of the fetus." Abortion rights activists certainly view this bill as unfair and manipulative. They see it as a means by which to dissuade women seeking an abortion form getting the abortion. Well, I hope so! All human beings are designed with a conscience, including scared, pregnant women and fathers. If an ultrasound image and a little more time to reflect on the decision can help clear the head and prompt a more conscientious decision, then I'm all for it. Two items have prompted me to write about abortion here. First, is this ongoing moral/political battle in our culture, evidence by HB 184 in my own state of Kentucky. I think it is important for the church to wrestle with the issue and apply consistently and faithfully the Bible to the issue. Second, a recent conversation I had with a high school senior boy reminded me that we have a generation of young people, even in the church, that do not think logically about ethical issues. They are captive to the individualist and pragmatic driven culture. The movement for a right to birth control preceded the push for abortion rights. In Griswold v. Connecticut (1965) the Supreme Court applied the concept of a constitutional "right to privacy" to birth control. This case legalized all forms of birth control for married couples. Before 1973 states had made laws that made abortion illegal. However, the women's rights movement in conjunction with the loosening of restrictions on contraceptives eventually led to abortion rights activists pushing a case in Texas all the way to the Supreme Court. The suit claimed that Texas state law violated a woman's constitutional right. Of course, the big question was exactly which constitutional right was being denied to women by the Texas law that made abortion illegal. The Supreme Court case Roe v. Wade relied on the earlier Griswold v. Connecticut in which the court upheld a person's right to privacy in contexts in which the state had no compelling interest. The specific part of the constitution that the Texas state law violated was the due process clause of the 14th Amendment. The court reasoned that a woman's right to privacy in regards to getting an abortion was protected by the due process clause, therefore the Texas law was a violation of her constitutional rights. The precedent laid down in regards to access to birth control was applied to abortion. In other words, it seems the Supreme Court essentially viewed abortion as a form of birth control, at least in legal application. However, the obvious difference between preventing pregnancy and terminating pregnancy brought up serious ethical concerns. From beginning to end the discussion and legal arguments centered on the rights of the pregnant woman and how the constitution might be applied to her decision to terminate her pregnancy. Absent from the courtroom drama was any serious discussion about the unborn themselves. The question of whether an unborn fetus constituted human life was not addressed, which would seem to be the most pertinent question. Ironically, this was not the issue for the court. However, the moral debate rages on. And it seems that in the moral discussion there are two key questions that must be posed and answered. First, is human life valuable and worth protecting? Second, when does human life most logically begin? The answers to these questions should determine how you feel about the issue of abortion and consequently the legality of the practice. I think anyone, regardless of religious views, must answer these questions. However, for the Bible-believing Christian, another layer is added. What principles does the Bible present as guidance on this hot political issue which is also a huge moral issue? In regards to the first question, I believe it is safe to assume that the vast majority of people believe that human life is valuable and worth protecting. Our laws aimed at protecting ourselves and others and the consequences for violating those laws clearly evidence this. However, there are some who might conclude that some human life is more valuable than other human life. I'll come back to this at the end. In regards to the second question, logic alone would seem to dictate that the most reasonable time on which to place the beginning of an individual human life is at the moment of conception. We can talk about heartbeats, viability and other items, but these are all related to development not origin. If I were to ask you, when did your physical existence logically begin, I think you would be hard pressed not to concede that all that went into making you was present at conception. After that moment you simply developed. Declaring any other place on the continuum of in utero human development as the beginning of an individual's life seems arbitrary. The Bible doesn't address abortion directly. However, it certainly underscores the value of human life. The Christian worldview holds that humans are a special creation of God, created in God's image. We read about God's love for humanity. We read about God's condemnation of murder and the exploitation of the poor. We are told to love others and do them good, not harm. You get the idea. All throughout the Scripture is the grand implication that human life is special and valuable. In addition, there are many implications that God considers the unborn human. The Psalmist wrote, "Thou didst weave me in my mother's womb. I will give thanks to Thee, for I am fearfully and wonderfully made...(Ps. 139). There is biblical evidence that God in His omniscience knew of our existence even before our physical conception. The Lord told Jeremiah, "Before I formed you in the womb I knew you." 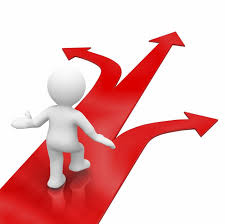 The Bible speaks to God's children being chosen "before the foundations of the earth"(Eph. 1). From a divine point of view, my existence was foreknown by God. What does all this mean? For the Christian, the debate about abortion should gravitate toward the work and character of God. In other words, forget political party allegiance and legal arguments. The Bible clearly tells us that God created humans special with value and that in the mind of God our life is in Him even before conception. But since we live in this finite, physical existence maybe we should just stick to physical life, which again logically begins at conception. Most people who want to support "reproductive rights" or "choice" want to squirm around the issue of when life begins. It's easy to see why that would be unsettling. Because even those who argue for abortion rights value human life. This is a vexing contradiction. So, to sooth the conscience we need to rationalize that real life begins at viability or even birth. Now I can feel better about the unborn who are terminated at 8 weeks or 12 weeks - they're not real humans yet. But wait, now there are those who boldly declare that human life does indeed begin at conception, but so what. Some human life is more valuable than other human life. You might think I'm making this up, but I'm not. Check out an article by Mary Elizabeth Williams in the online news site Salon from January 2013 entitled, "So What if Abortion Ends Life?" I won't spoil the whole disgusting read for you, but I'll quote you her concluding words: "I would put the life of the mother over the life of the fetus every single time - even if I still need to acknowledge my conviction that the fetus is indeed a life. A life worth sacrificing." And when she refers to the life of the mother, she means the choice of the mother. All I can say is about Mrs. Williams, is thank you for your honesty as ghastly as it is. I'm wondering if our American collective conscience is gravitating towards Mrs. Williams' combination of brutal honesty and callousness. 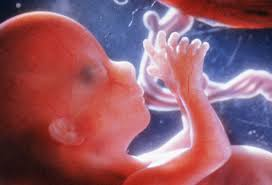 Are we moving now into a culture in which we finally acknowledge that the unborn are indeed human, but we view them now as the expendable humans. Since the abortion-rights crowd is tiring of the absurd verbal gymnastics that nobody really buys, have they decided it's time to just speak the truth - that what they want is the right to kill in utero human life at their own discretion? As much as Mrs. Williams disgusts me, at least she is logically consistent. Church, we need to be on the right side of this moral argument. If you are a Christian, you need to use your brain on this one and your heart. You need to seek God and the counsel of His Word. You need to sweep aside the cultural and political pressures and consider deeply where our country is headed on this issue. I can remember the passion in people in the wake of Roe v. Wade when I was a teenager. For teenagers today, abortion is a normal part of their existence. As far as they are concerned, that's just the way it is and always has been. To them, 1973 is ancient history! Church, we have to teach our young people to think biblically and logically on ethical issues. America is collectively developing a frightening callous conscience in regards to the worth of the unborn. Don't be so foolish to think it will end there. Don't be ashamed to stand boldly and defend the lives of those who cannot defend themselves. 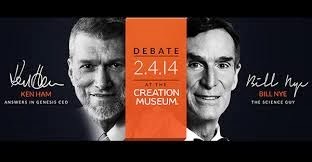 Tonight (Feb 4) at 7 pm (EST) Bill Nye (the science guy) will be Ken Ham's (Answers in Genesis) guest at the Creation Museum in northern Kentucky. Before an audience of 900 and before who knows how many in gatherings of all sizes around the country, the two will go head to head on the issue of science. Ham will defend the legitimacy of a worldview that places confidence in a universe ordered by a divine creator. Nye will claim that the world around us only makes sense if you accept the theory of evolution. The event has created an enormous amount of chatter. A very nice feature of this debate is that it will be accessible live via the internet for free. It will be available at debatelive.org. At First Baptist Hazard we will stream it into our building, and we hope that many people in Hazard will come. This will not be a church service and it's not a hook to try to push religion on anyone. We simply want to gather folks together of all opinions to join the conversation. I want us to consider these worldviews and thoughts about the existence of God and the claims of evolutionary science. I hope that Christians and non-Christians will come and participate. I think this debate is valuable for all of us, believers and skeptics alike. Often we have strong disagreements and views about issues concerning the claims of religion and those of science. However, I think this debate offers all of us an opportunity to enter a civilized, rational conversation, stretching us to think a little more critically than we do on any given average day. Questions about God, existence and the meaning of life are no small matters. It doesn't matter what worldview you hold, what we need is more constructive conversation when it comes to these issues of science, religion and education. I hope that if you're in the Hazard area that you'll come join us for the debate (Feb 4) at First Baptist Church. We will begin at 6:30 pm, with the debate scheduled to start at 7:00 pm. Otherwise, I hope you'll gather some family and friends, get around a computer or TV and watch it and then have your own conversation to follow.